CRISPR is a gene-editing tool that is transforming bioscience. Surprisingly, this innovation emerged from discoveries about how bacteria defend themselves against viruses. Many bacteria maintain archives of DNA segments snipped from viruses that invade them. When the same type of virus attacks again, a bacterial cell dispatches a molecular apparatus that recognizes, targets, and strategically cuts through DNA to disable the virus. A decade ago, scientists who had elucidated the fundamental features of CRISPR—including Rockefeller’s Luciano Marraffini, then a postdoc at Northwestern—speculated that components of this bacterial defense system could possibly be adapted as a universal tool for gene editing. That possibility became a reality in 2012, when Jennifer Doudna at UC Berkeley—working with Emmanuelle Charpentier, now at the Max Planck Institute in Berlin—first published a paper detailing how they could use what is today known as the CRISPR-Cas9 gene-editing system to cut DNA at will in a test tube. Their report set off a revolution in laboratories worldwide, as scientists learned they could exploit CRISPR technology for targeting and editing gene sequences in virtually any cell’s DNA, with unprecedented ease, speed, and precision. 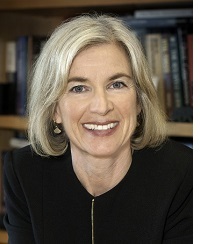 Jennifer Doudna is a professor at the University of California at Berkeley, a Howard Hughes Medical Institute Investigator, and executive director of the Innovative Genomics Institute. A member of the National Academy of Sciences, she is the recipient of many honors including the Breakthrough Prize in Life Sciences, Japan Prize, Kavli Prize, and Rockefeller University’s 2018 Pearl Meister Greengard Prize. Dr. Doudna is co-author of A Crack in Creation, a personal account of her research and the societal and ethical implications of gene editing.